The copy in the CK ad makes me a little crazy, but then I have a long-standing aversion to divided words...and especially words divided incorrectly. 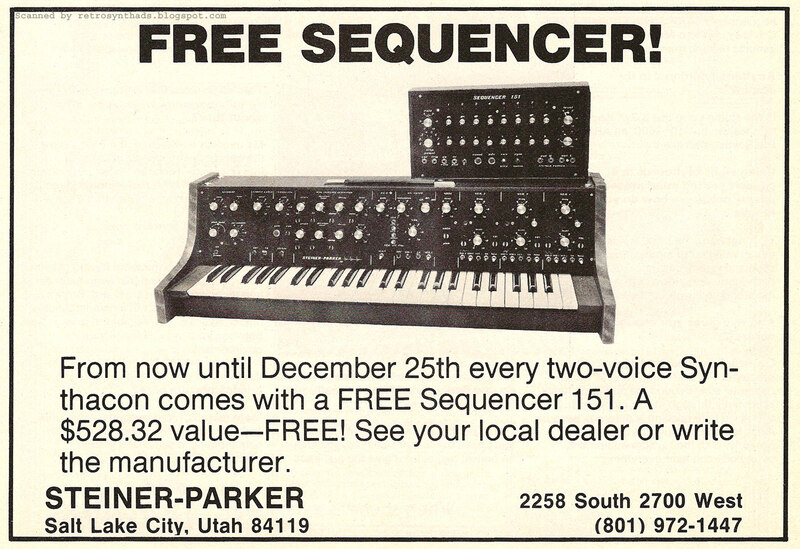 I'm suspecting that the S-P price list that you linked to in a previous post dates from 1976 (or possibly early '77) rather than 1975, because I'm pretty sure that the two-voice version, the multi-phonic keyboard and the 151 sequencer appeared later. 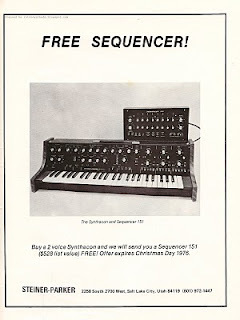 Nyle Steiner also made a few Synthacon's which, like the 'multiphonic' keyboard (shown in the first S-P advert), incorporated an arpeggiator. I think these were made on special order only. A few Synthacon's without a keyboard were also made, one of which was built for Shirley Walker to augment her stock Synthacon. 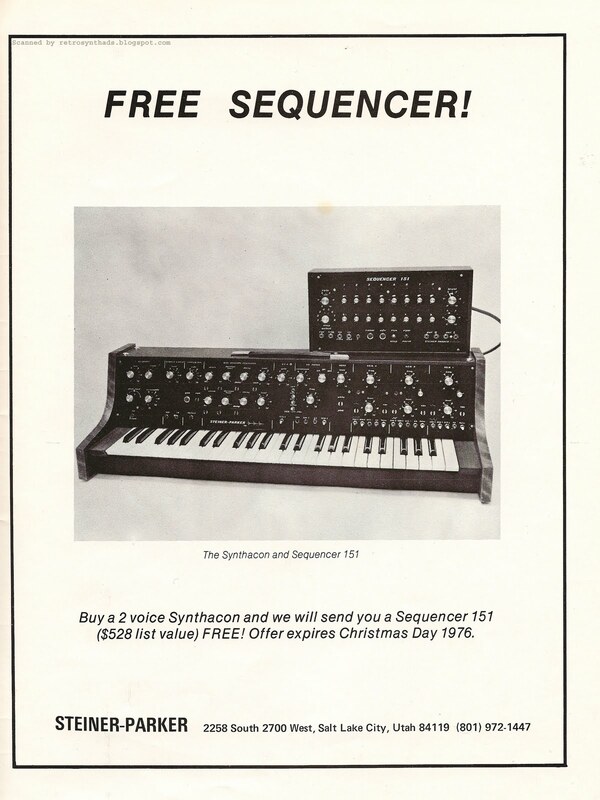 Shirley was using this "Double-synthacon" on the cues she recorded with Nyle Steiner for the Apocalypse Now soundtrack back in '79 (Nyle used his EVI hooked up with a Synthasystem). They performed/recorded the following AN cues together: 'Nung River", "Clean's Death", "Finale" plus a couple of unused tracks (Nyle performed on several of the other tracks as well). The EVI, Synthasystem and Synthacon are all over the above cues.
" we were sanding the aluminum ourselves. This was a laborious task and it was difficult to get consistent results. I recall that there was also some discussion with my partners about using black because it seemed to be a popular color for synth panels.I later discovered how to get consistent results in making brushed aluminum panels using a wet wire brush. That worked well enough that I sometimes made custom equipment with silver panels long after we had switched to the black painted ones." 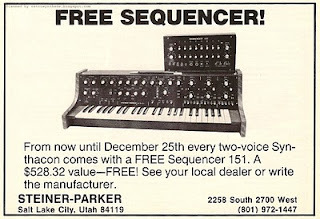 I would like to take this opportunity to thank you for an excellent synth blog.